This badge recognizes the achievement of the Dell EMC Proven Porfessional Expert - Implementation Engineer, NetWorker Version 6.0 certification. Earners of this badge will be able to perform advanced configuration and performance tuning of a NetWorker environment, including the configuration of NetWorker to protect enterprise applications such as Oracle, MS SQL, MS Exchange, and VMware vSphere. 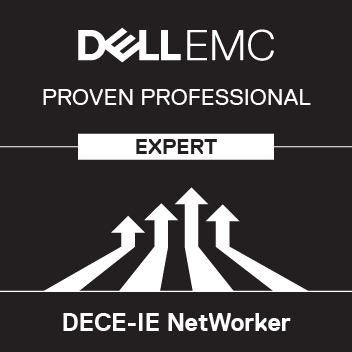 Achieve the Dell EMC Proven Professional Expert - Implementation Engineer, NetWorker Version 6.0 certification.